On the evening of March 30, a General Meeting of DP Diet Members was held at party headquarters. The meeting discussed a proposal regarding the party’s future direction, entitled, “Forming a new Democratic Party in order to protect democracy and the lives of citizens” which had been approved by the DP Standing Officers Council on the previous day. Following discussions lasting one and a half hours the assembled Diet members approved the proposal with a round of applause. At the start of the General Meeting, DP President Kouhei Ohtsuka stated, “We are now at the start of the new financial year. I have conferred with you all regarding the state of our party, and received much valuable guidance, and would now like us to make a new start.” He said that the proposal had been made as a result of various deliberations and consultations that had taken place based on the points approved at the party convention of February 4, in which the DP had determined to “aim for a ‘new centrist party’ as soon as possible.”. Ohtsuka went on to say, “I am well aware that there are a variety of opinions within our party. Over the past 5 months I have listened to the voices not simply of our Diet members, but also of local assembly members, party staffers and those outside our party, and thought hard about what route we should take. I ask for your understanding of the fact that it would be impossible to craft a proposal that would be welcomed wholeheartedly by everyone. At this moment, with the current developments in the Moritomo Gakuen scandal, the Abe administration style of governance, with its blatant disregard of democracy, has reached its limits. 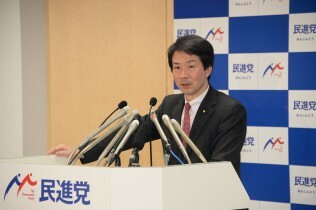 That is why we made the joint decision it was now time to make this proposal, with a view to uniting our colleagues who had been so ridiculously scattered apart at last year’s general election.” Ohtsuka went on to explain the main points of the proposal. After receiving Ohtsuka’s proposal, the General Meeting transitioned to a discussion forum, where the assembled Diet members exchanged views for an hour and a half. Once discussions had generally come to a close, the General Meeting was reconvened. Ohtsuka stated, “Whether they are members of the Constitutional Democratic Party, the Party of Hope or totally independent Diet members belonging to none of our three parties, our common enemy is still the Abe administration, the LDP administration that totally ignores democracy. Therefore, we should join in a common purpose and form as large a grouping as possible. Even if we do not succeed in persuading the Constitutional Democratic Party to join us, this proposal includes a framework which each of our parties can aim for from our various perspectives, so that we can continue to cooperate and unite together to fight the general election.” The meeting then approved the proposal to form a “new Democratic Party” with a round of applause.